Lovers of cashews might need to read this one. 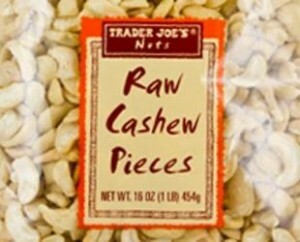 Trader Joe’s has issued a recall that went out on January 15 for the product known as Raw Cashew Pieces, due to a possibility of salmonella poisoning. The company sent an alert out to the supplier that one of its lots of products might have been contaminated by the bacteria. The products that were affected are those, which have labels reading – BEST BEFORE 07/17/2016F4. The raw cashew pieces have been distributed to 31 states including Georgia, Kentucky, New York, Michigan, Pennsylvania, Ohio and Vermont amongst others. This recall started as American Heritage International announced after a report by the FDA that one of the lots of cashew pieces has been contaminated with salmonella. The routine testing of the contract laboratory of the agency revealed the salmonella contamination findings from other lots of Trader Joe’s also conduct additional testing on the affected lot, but no other contamination was found. Although the positive result of salmonella was noted in just one lot only. It was decided by Trader Joe’s to recall every lot of the cashew pieces out of an abundance of caution. Trader Joe’s said the products were all removed from the counter of stores and that sales were cancelled while the investigations continue. Thus far, there have been no illnesses reported that are related to the issue. The instructed customers from Trader Joe’s who purchases the product have been told to not consume it and advised to discard it or return it of a complete refund of your money. The food recall was not the first for Trader’s Joes. During March of 2015, the company issued a food recall for its walnut products due to the salmonella scare. Salmonella is a bacterial organism that could infect even healthy individuals and cause fever, abdominal pain, vomiting, diarrhea, which might become somewhat bloody. Younger children, older adults and those that have weakened immune system could become exposed and might experience illnesses that are more severe than others.